The USADA has released a report on Lance Armstrong’s doping case. After reading the summary here in the New York Times I find it virtually impossible to think that Armstrong wasn’t doping all along. What a sorry outcome. I used to love watching cycling but now I’ll never trust it again. The United States Anti-Doping Agency on Wednesday released details of its investigation of Lance Armstrong, calling it the most sophisticated doping program in recent sports history — a program in which it said Armstrong played a key role by doping, supplying doping products and demanding that his top teammates dope so he could be successful. 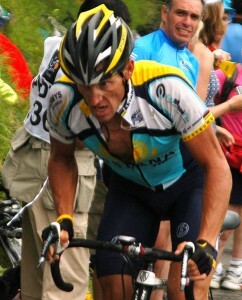 via Antidoping Agency Details Doping Case Against Lance Armstrong – NYTimes.com. I knew this day would someday come. For years I’ve been a fan of Lance Armstrong but over the years I began to realize that he’s not Superman. There’s no way he could be clean when so many of the other greats in the sport have fallen from doping allegations. Armstrong has access to the best lawyers and perhaps had access to the best alleged doping schemes. In the end, though, there’s no way his years-old drug testing samples could outlast the advancign science of drug testing. Armstrong still doesn’t admit to doping, but his action yesterday tells me all I need to know. I’m disappointed that this day has come. The U.S. Anti-Doping Agency said Thursday night it will strip Lance Armstrong of his unprecedented seven Tour de France titles after he declared he was finished fighting the drug charges that threaten his legacy as one of the greatest cyclists of all time. Travis Tygart, USADA’s chief executive, said Armstrong would also be hit with a lifetime ban on Friday. via USADA to ban Armstrong for life, strip Tour titles – WRALSportsFan.com. The NCAA slapped Penn State with a massive $60 million fine, vacated a decade of victories, and took away scholarships for four years as punishment for the Jerry Sandusky scandal. While I don’t know how Joe Paterno slept at night knowing the evil that Sandusky was committing, I’m not sure sanctions are right for this case. Paterno’s actions may have been cowardly and cold-hearted but the athletes and alumni aren’t at fault. Punishing them seems misguided. Meanwhile, over in Chapel Hill it’s beginning to stink to high heaven with the allegations of egregious academic fraud, yet those in Baby Blue get off with a slap on the wrist. Go figure. To me, as heinous as this matter is — and it is undeniable that it is far worse than impermissible benefits or academic fraud — it was still a matter for law enforcement as opposed to the fellow member institutions that make up the NCAA. The people responsible for what occurred are either in jail for life, headed there, or dead. What has happened today, with the announced penalties, severely punishes hundreds of people who had exactly nothing to do with the past culture of football isolationism. via In getting it wrong the NCAA might have actually found their voice – WRALSportsFan.com. Yesterday Travis’s baseball season ended with a whimper when late afternoon storms rained out his last game. Though thunder rumbled and rain fell, I sat in my car next to the field, hoping against hope that some miracle would occur and the game would go on. Sadly that miracle never came, and my phone soon rang with a call from Kelly, telling me that the parents of the other Bees teammates had thrown in the towel. I was surprised at how sad that made me. Kelly and I agreed that we will probably miss the games more than Travis will. There’s something magically simple about being on the ball field, where one’s only worry is the game itself. All is right with the world. There’s something especially magical about watching as our son progressed and improved throughout the season. As an assistant coach, I’ve been proud to watch as Travis and teammates came together as a team. With a five-run limit before changing up, our coach wanted to slow down the runs, giving our players as many batting chances as possible. As the third-base coach, I would wave runners on for a double or triple but more often I would hold them at third. I guess I’m still trying to stretch out the game, trying for one more hit for Travis, or one more goal for Hallie’s soccer game, or just one more after-game hug. Every season ends. the players grow up and move on, and we’ll never live that moment again. It’s kind of sad, isn’t it? As a Wolfpack fan and an alum of N.C. State, it might be easy for me to gloat about the academic scandal taking place with UNC’s football and basketball players. The vaunted “Carolina Way” that Carolina people love to preach has turned out to be amusingly hollow. It seems that academic performance takes a back seat to winning. It would be amusing under most circumstances. Then I hear what N.C. Athletic Director Debbie Yow says about the Wolfpack teams and it makes me wonder: what’s to stop the Wolfpack from falling into the same trap? I don’t question Yow’s dedication to N.C. State at all but there’s more to winning than the win and loss counts. Is Yow equally dedicated to academic performance? If it came down to winning or looking the other way when academic shenanigans take place, what would Yow do? The kind of money being thrown around in college sports is in doubt corrupting. I can only hope my school is strong enough to resist the urge to cut corners. Hallie played her first basketball game in her tournament last night and again I was playing assistant coach. The tipoff was after 8:30 and it was neck and neck most of the game. Then, down by three at the start of the fourth quarter, coach Lamonica Germany put in all of our shooters in a gamble to even the score. Somehow we pulled within one before subs were called and our “first-team” came out. Before we knew it we were facing a three point deficit again. There were three minutes left in the game when I looked down the bench and saw four of our five top players sobbing uncontrollably (hey, they’re 9 years old). There was a lot of spirit there and I could see how much they wanted to win. A timeout was called with about two minutes left and our shooters got back in the game. True to form, they used that emotion to step up their games. Within seconds we scored two three pointers in a row to take the lead. With a minute left in the game we had a seven-point lead and cruised to eventual victory. It was an emotional game, and a real wonder to watch the kids apply their willpower to pull out a win. As amazing as the win was, it was also a bit too exciting for that time of night. I didn’t get to bed until 11 and slept fitfully the whole night. Guess I was a little too pumped up! Hallie’s team plays again this evening at 6 (and if things go well, again at 8 for the championship game). I don’t know if I can take much more of this! Sports pic of the year? Ethan Hyman - ehyman@newsobserver.com - N.C. State Ethan Hyman - ehyman@newsobserver.com - N.C. State's Mark Gottfried can't believe a foul was called on the Wolfpack during the second half of N.C. State's 61-60 loss to Virginia on Saturday in Raleigh. I love this photo Ethan Hyman of the News and Observer took of N.C. State basketball coach Mark Gottfried reacting to a foul call during yesterday’s loss to Virginia. 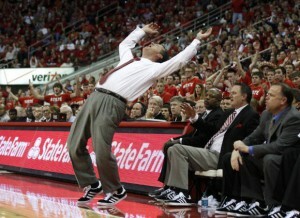 In capturing Coach Gottfried’s acrobatics, Ethan’s photo conveyed the thrilling nature of ACC basketball in a nutshell. With classes in some cases growing from 200 students to 300, faculty members struggle against a growing tide of test grading and other mundane chores, Chancellor Randy Woodson told the trustees committee. “It takes them out of the business of being scholarly, of doing research and of moving the economic engine of this state forward,” Woodson said. Is it any wonder I’m disillusioned with higher education? Is it also any wonder that these schools’ big-time college sports programs get away with what they do? Here’s more on the 100 Up running exercise that the New York Times Magazine discussed. The video below is helpful to see what the proper technique is. The 100 Up exercise, which McDougall is touting as a surefire technique for training away these bad habits, is actually an incredibly old invention of a long dead English chemist apprentice. Since he was English, in this case being a chemist probably refers to a pharmacist. W.S. George developed his exercise pattern so that he could train for running even while busy at work all day. The technique was apparently quite successful, as George went on to achieve world record times in several short and middle distance races. via The 100 Up Exercise: Method for Training Barefoot Running Form | Naturally Engineered. Here’s a thought-provoking look at how the way people are running today may be leading to more injuries than the way people run naturally when they’re barefoot. It’s what Alberto Salazar, for a while the world’s dominant marathoner and now the coach of some of America’s top distance runners, describes in mythical-questing terms as the “one best way” — not the fastest, necessarily, but the best: an injury-proof, evolution-tested way to place one foot on the ground and pick it up before the other comes down. Left, right, repeat; that’s all running really is, a movement so natural that babies learn it the first time they rise to their feet. Yet sometime between childhood and adulthood — and between the dawn of our species and today — most of us lose the knack. via The Once and Future Way to Run – NYTimes.com.